Always wondered what Twitter or Tweeting’s worth? Besides growing your business (with the help of some serious corporate-gyaan from Hubspot on utilizing Social Media and Inbound Marketing), you can actually get your name printed/published in a local newspaper! I drove 600+ KMs during the weekend... mainly in and around Pune city. And I wonder why I hated driving to work this morning! 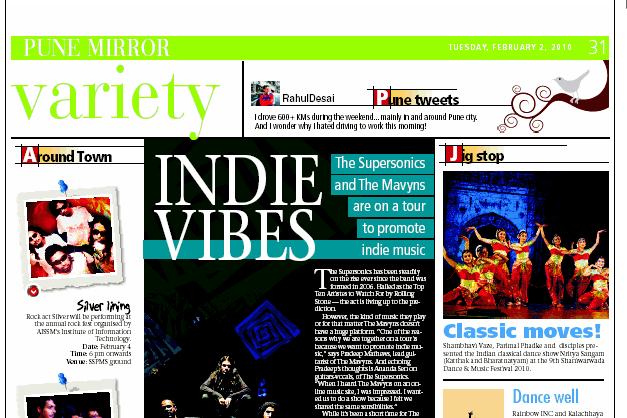 I had stopped reading Pune Mirror ever since they dropped ‘I love Pune/ I hate Pune’ section. Now I realize I had been missing on some good stuff from good people. Thanks a lot Dev for bringing this to my notice. You made my day!